Looking for a LIMS to guarantee donor privacy and ethical use of biospecimens? Read our white paper on “The role of LIMS in meeting biobank regulatory requirements and ensuring operational quality”. Evaluate the benefits of cloud technology assisted laboratory informatics! Our tutorials provide detailed instructions to prospective users and existing users who need a refresher on how to use our products. Check out our recent tutorial on How to Import Sample data From a File using CloudLIMS. CloudLIMS version 1.72 is out! CloudLIMS accelerates biobanking, clinical research, testing and diagnostic operations by efficiently managing laboratory services (sample purchase, sample storage, and tests) and enhancing laboratory customer service through the use of CloudLIMS’ client portal. CloudLIMS, a bronze sponsor of ISBER 2018 Annual Meeting & Exhibits, is excited to exhibit at the annual meeting, to be held in Hyatt Regency Dallas Hotel. Read our blog article on "CloudLIMS @ISBER 2018 Annual Meeting & Exhibits, Dallas, USA". Subscribe to follow regular updates on product releases, events, conferences, posters, articles, white papers, webinars, and much more! Metrc is a trademark of Franwell. 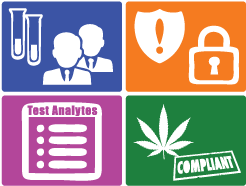 BioTrackTHC is a trademark of Bio-Tech Medical Software, Inc.